Please be advised that Selkirk Park will be open and the docks will be in place for the opening day of fishing season, May 12th. 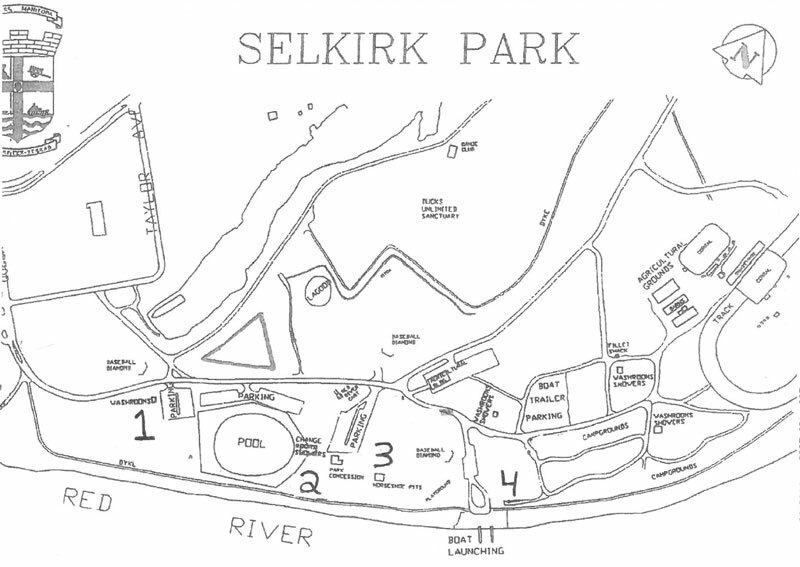 Selkirk Park is located next to the Marine Museum on 490 Eveline Street (corner of Queen Ave/Eveline St) at the north end of Selkirk on the banks of the Red River. Selkirk Park opens annually on the May long weekend and closes for the season in late October. During the summer months Selkirk Park is open 7 days a week with the park gates locked from 11 pm until 6 am. Selkirk Park Campground is located next to the Marine Museum on 490 Eveline Street (corner of Queen Ave/Eveline St) at the north end of Selkirk on the banks of the Red River. Selkirk Park Campground opens annually on the May long weekend and closes for the season in late October. Selkirk Park Campground is open 7 days a week, but the park gates are locked from 11 pm until 6 am. Campground reservations can be made once the campground opens; 2nd week of May, weather permitting. Rates below are proposed rates for 2017, to be finalized in April 2017. Last day this season to use the boat launch will be Wednesday, November 7. Selkirk Park has four boat launching pads available with docking facilities. Vehicles and boat trailer parking is available in designated areas. For more information please call the Campground Office at 204-785-4958. Organizations planning a fishing derby are requested to book this facility by calling 204-785-4950. Selkirk Park has four large picnic areas available for events such as company, family, church or club picnics. Picnic tables may be requested. Some areas include sports fields. Reservations of picnic areas are provided free of charge to residents and are on a first come – first served basis. Non-residents can reserve a Picnic Area for a fee of $50.00. For more information or reservations call 204-785-4950. Currently not available for reservations. The Community Trail began with the Selkirk Birdwatchers Club wanting to develop a nature trail for anyone to enjoy all year around. The Trail has four separate trails of different lengths, and four rest/picnic stops for birders, hikers, skiers, or snowshoers. It winds through the Maritime Museum and Selkirk Park where swimming, camping, picnicking, and special attractions are offered.The Trail was given financial assistance from the Selkirk Lions Club, the Millennium Bureau of Canada, and the Birdwatchers Club itself. The design, clearing, and ongoing maintenance has been provided by community volunteers from the Club, the Gordon Howard Centre, Selkirk Lions Club, students of the Lord Selkirk Comprehensive High School, and staff of the City of Selkirk. It is hoped that the Trail will eventually form a part of the national Trans Canada Trail. Blue Jay: Length 9 1/2- 12 in. Look for pointed crest; black “necklace”; bright blue above, with white wings and tail. Pileated Woodpecker: Length 14-18 1/2 in. Look for large size; red crest; black, white, and red pattern on head.Mostly black with white wing linings conspicuous in flight. White Breasted Nuthatch: length 5-6 in. Look for black crown and nape; blue-gray above; white below; bill long and straight. Red Winged Blackbird: Length 7 1/2- 9 in. Look for, male black with yellow- bordered red shoulder patch; female dark brown, heavily streaked. Robin: Length 9-11 in. Look for reddish orange chest; dark grey above; with broken eye ring. Within Selkirk Park there are 22 acres designated as Ducks Unlimited Projects. The Bird Sanctuary provides a great opportunity to view a marshland environment within an urban setting. Viewers can expect to find nesting Canada geese, deer, many species of ducks and songbirds. Chickadee: Length 4 1/2-5 1/2 in. Blue Jay: Length 9 1/2- 12 in. Pileated Woodpecker: Length 14-18 1/2 in. White Breasted Nuthatch: length 5-6 in. Red Winged Blackbird: Length 7 1/2- 9 in. Yellow Warbler: Length 4-5 in.